SUBHEAD: We must use our time wisely in the most monumental test our species has faced. 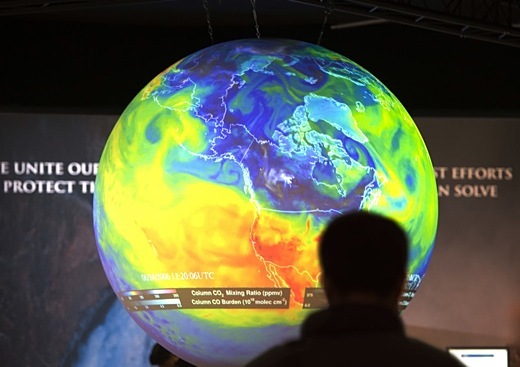 Image above: People watch a globe at the United Nations Climate Change Conference (COP21), in Le Bourget, France, on December 10, 2015. Photo by Miguel Medina. From original article. Calcium carbonate, or calcite, lines the ocean floor. When calcite combines with carbon dioxide and water, the reaction produces calcium ions and bicarbonate ions. Because of this, the surrounding water becomes less acidic over long periods of time — think tens to thousands of years. But when you throw more carbon dioxide into the equation, all of the seafloor calcite starts to get used up to power these reactions in extremely large amounts, meaning that the ocean floor is dissolving. Now, there’s not enough calcite but more carbon dioxide than ever, driving up acidity levels. A very important recently published article by Yale Environment 360 showed how Earth’s climate zones are literally shifting due to climate change. This is bringing about food and water scarcity, and resulting in mostly negative consequences for local economies and public health. Some of the highlights of the article: The tropics are expanding by 30 miles each decade, the Sahara Desert has gotten 10 percent larger since 1920, and the 100th meridian in the US — the line where the arid Western plains of North America meet the wetter eastern region — has shifted 140 miles to the east. We are all acutely aware of the growing number of people from Central America heading toward the southern US border. But what is usually not reported by the corporate media is that a vast percentage of these migrants, particularly those from Guatemala, are migrating due to climate change impacts like drought and shifting weather patterns, which are making life ever more difficult for small-scale farmers there. In a dramatic indication of the rapidly diminishing cryosphere, a large glacier in China that draws millions of tourists annually is melting away before our eyes. The Baishui glacier, at 15,000 feet, is part of a massive blanket of ice in Central Asia referred to as the “third pole,” given that it is the third largest store of ice on the planet, behind Greenland and the Antarctic. The area of ice, roughly the size of New Mexico and Texas combined, is vital as a water source for billions of people in Asia, and the 10 largest rivers in Asia rely heavily on its seasonal melting. In fact, it is one of the largest sources of freshwater on Earth, and it is in trouble. Scientists working in China found that, by 2015, 82 percent of the glaciers they surveyed in China had retreated. A study published this year showed that the Baishui had lost 60 percent of its mass and shrunk 820 feet since just 1982. The rhetoric of climate denial is shifting, according to a recent report by Vox. The Republican Party, having become aware that — given the regularity of catastrophic climate events that is now undeniably upon us — engaging in ongoing denial of climate change makes them look bad, has shifted its wording again. Rather than denying outright the reality of climate change, some Republicans are now increasingly challenging the idea that it is human-caused … while, of course, continuing to do the bidding of its fossil fuel funders. The rhetoric may have shifted, but in a sense, it doesn’t matter: Republicans are still working against any policy changes that might threaten the profits of Big Oil. “Last November, the COP23 UN Climate Change Conference in Bonn reported that warming by 3°C by 2100 is now the realistic expectation,” reads the report. “With no check on emissions, we are on course to see preindustrial levels of CO2 double (from 280 to 560 ppm, or parts per million) by 2050 – and then double again by 2100.